* The specification MSS SP-110 addresses valves design with handles. The X440 does not include a handle. 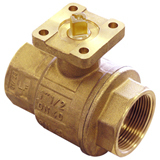 Other than t his exception, the valve meets the design criteria of the specification.